You can not be certain that you suffer from fructose malabsorption until using a professional test. 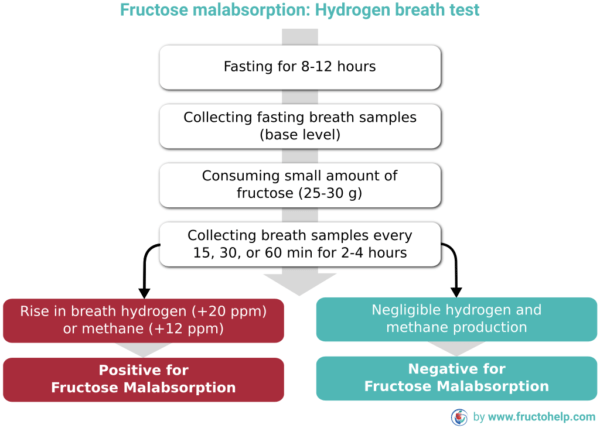 Testing fructose malabsorption is commonly done using a hydrogen breath test, which measures hydrogen (and methane) production within your body after consuming fructose. It is a safe and non-invasive technique with a sensitivity and specificity of about 98% and 86% respectively. The test is based on the failure to absorb fructose in case of fructose malabsorption. Bacteria metabolize non-absorbed fructose to either hydrogen or methane. These gasses are partially absorbed into the blood and reach the lung. So, the more of these gasses are present, the less fructose has been absorbed. Testing fructose malabsorption is performed after a short fasting period of 8-12 hours. During the last 2 hours, you are not allowed to smoke and exercise. 3-4 measurements are taken directly after fasting and serve as basal level. You then consume a small amount of fructose, typically between 25 and 35 g (a glass of orange juice contains about 15 g fructose) and your breath is analyzed for hydrogen/methane every 15, 30 or 60 minutes for 2-4 hours. If the hydrogen level rises above 20 ppm (parts per million) over the lowest value within the test period, you typically get diagnosed with fructose malabsorption. If methane is produced instead, then the limit is about 12 ppm. For those, who like watching videos, I have also attached a nice one explaining that process. So, get checked to be sure you are suffering from fructose malabsorption and then move on to my Fructose Malabsorption Diet and Food List pages. Or, if you want to perform some other self-check, then read on. Another way to find out, if you are a fructose malabsorber, is to strictly eliminate fructose, fructans, and sorbitol from your diet for at least three days. Three days of such a diet should be enough, to obviously improve symptoms of people with fructose malabsorption. 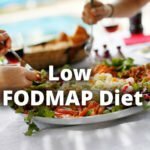 You will find the food you can eat during that time on my Fructose Malabsorption Food List and also in one of the apps under Helpful Resources. For further analyzing whether you are suffering from fructose malabsorption, you should keep a detailed food and symptom diary for a few days or weeks. Write down every time you eat or drink, what it was and whether you experienced symptoms. Also, note the times. This is important, as some food may make you sick right away, others after a few hours. It will be hard to figure out later, which food caused the symptoms. You can print my food diary template or you can have a look at apps like “mySymptoms Food Diary & Symptom Tracker” (Android, iOS), which simplify that work. A few of these “food and/or symptoms diary” apps also provide some diagnostic functionality, such as emerging patterns between diet and symptoms, and the option for generating pdf reports. This can come in handy when talking to a physician. Check out the Helpful Resources for further apps. Do you know further self-checks? Leave a comment! Götze H, Mahdi A. Fructose malabsorption and dysfunctional gastrointestinal manifestations. Monatsschr Kinderheilkd. 1993. Uday C Ghosal. How to interpret Hydrogen Breath Tests, J Neurogastroenterol Motil. 2011 Jul; 17(3): 312–317.